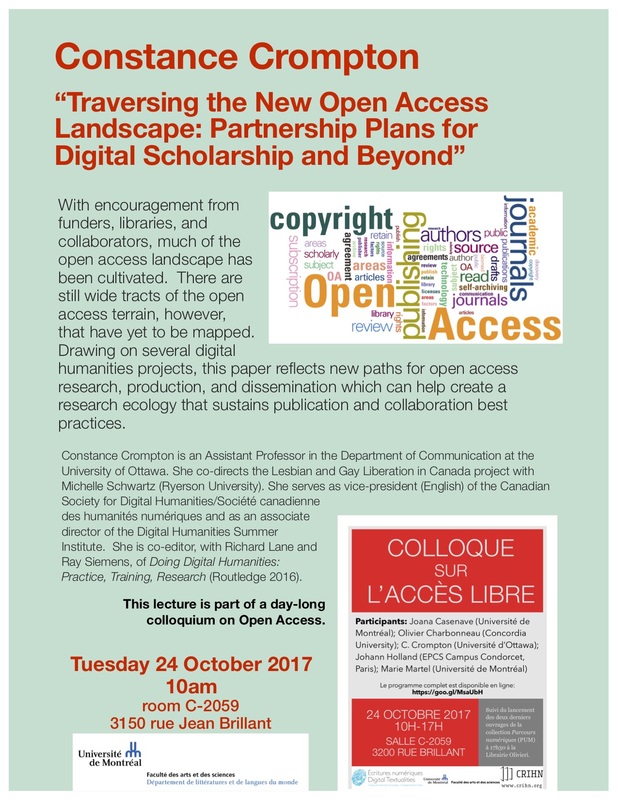 With encouragement from funders, libraries, and collaborators, much of the open access landscape has been cultivated. There are still wide tracts of the open access terrain, however, that have yet to be mapped. Drawing on several digital humanities projects, this paper reflects new paths for open access research, production, and dissemination which can help create a research ecology that sustains publication and collaboration best practices. Constance Crompton is an Assistant Professor in the Department of Communication at the University of Ottawa. She co-directs the Lesbian and Gay Liberation in Canada project with Michelle Schwartz (Ryerson University). She serves as vice-president (English) of the Canadian Society for Digital Humanities/Société canadienne des humanités numériques and as an associate director of the Digital Humanities Summer Institute. She is co-editor, with Richard Lane and Ray Siemens, of Doing Digital Humanities: Practice, Training, Research (Routledge 2016). Ce contenu a été mis à jour le 9 octobre 2017 à 15 h 47 min.